The internet has converted the way we not only teach, but the way we learn. 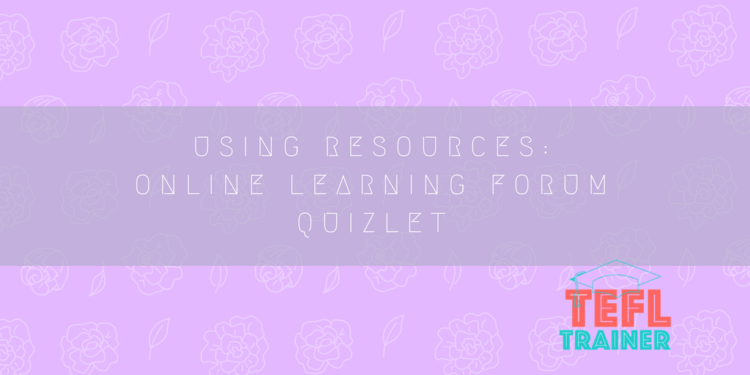 Gone are the days of losing post sticks and q-cards as they can now be stored online by using the online learning forum Quizlet. I would recommend Quizlet for a variety of reasons, especially when it comes to learning a new language. It also tackles three of the learning styles such as spatial, auditory and linguistic which will be explained in more detail as we look at its advantages in order to support its learners. What’s more is that it accommodates both teachers and pupils. The pupil also mocks the teaching method as they are able to teach themselves. Interestingly, there are 7 different ways to learn, for example, spatial learning can be targeted by using their picture options or even the games that require the emphasis on your visual reactions. Furthermore, in order to target pronunciation one can also listen to words being pronounced, a great way to target audial learning. The orthography option deems the best to test ones writing, an extremely important aspect when learning a language. It asks the learner to type the word they hear. It also makes the learner an independent learner, they are their own teachers and there is no better gratification that viewing your own development and progress. The web page also benefits teachers as there is an area that enables you to teach classes in which the students can follow. Personally, I will always opt for using Quizlet as it targets each are of learning and has improved my own ability and determination to learn myself. Through personal experience I have found that ESL learners find it extremely difficult to just grasp a word with the dictionary definition. Therefore, the website enables you to show your own images as associative memory hooks, by using images this enables them to visualise and associate with the word. This is a powerful tool as many learners triumph with spatial learning.